Founded in 1936, the Society is the oldest community organization on the Upper Main Line conducting local historical research, and collecting local resources and photographs, pertaining to the townships of Tredyffrin and Easttown in eastern Chester County, Pennsylvania. Please note the later date for the April meeting! 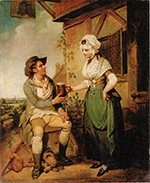 Clarissa Dillon will explore the significant role played by mildly-alcoholic beverages in everyday Colonial life. Our History Quarterly Digital Archives are available to all for viewing and searching. This valuable local history resource contains most of the issues published since 1937, and provides details and unique perspectives on many aspects of our historic community. Our extensive and ever-growing Image Collection online database is hosted in Mike Bertram's section of the site, and features a searchable partial inventory of our collection of historic images. Mike's Tredyffrin History Digital Archives section of the site, features interactive maps and useful information about tax & census returns, roads, mills & tanneries, inns, currency, war reparations, and more. The Easttown Deed History section of the site showcases Mike's research on the history of land ownership in Easttown. The Charlestown History Digital Archives features Mike's interactive maps and information about tax & census returns, genealogy, mills & other buildings, currency, war reparations, and more. 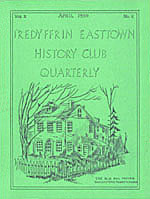 Copyright © 2006-2019 Tredyffrin Easttown Historical Society. All rights reserved.